After the Forth Crusade’s sack of Constantinople and the establishment of the Latin Empire in 1204, water supply systems, which were built during the Roman period, inside and outside the city walls were totally blasted. After the Ottoman conquest of Istanbul, one of the matters to be dealt with first by Sultan Mehmed II. the Conqueror was to meet the city’s running water requirements. Sultan Mehmed II. (Fatih) ordered a thorough repair of all water supply systems. In the course of time increasing population let to water shortages. 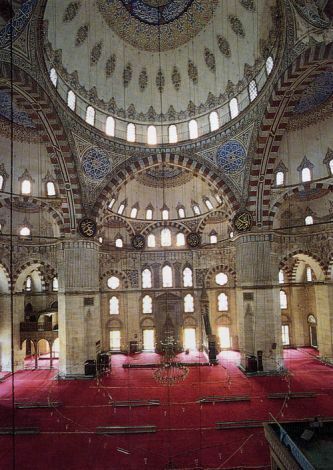 Sultan Süleyman the Magnificent commissioned Sinan, his engineer and architect-in-chief, to solve this problem. Sinan undertook important works for the supply of water to the cities of Istanbul and Edirne. The Kırkçeşme System was rebuilt and redesigned by Sinan in 1555 – 1563/4. The preliminary studies were made under the constant supervision of Sultan Süleyman, and Sinan adopted a scientific approach in this task where mathematics held an important place. Istanbul's water was stored in the large number of reservoirs in the Belgrade Forest and conveyed to the city over aqueducts; this water then passed through distribution chambers located at various points in the city and thence was distributed to buildings and fountains within the city. Water from the Alibey and Kâğıthane streams was collected in pools and channeled to Eğrikapı and from there to the inner city. Due to the fact that there were no pipes about to withstand the excessive pressure, aqueducts were built to carry the water over the valleys. It can be observed that the precise measurements and calculations made in establishing waterways and in construction of the water supply lines, aqueducts and accumulation pools were just as reliable as those made today by means of modern instruments. It incorporates 33 large and small aqueducts, five of which are known to have been built by Sinan. There are four aqueducts in the Kırkçeşme supply system, completed in 1563: Uzun Kemer, Eğri (Kovuk) Kemer, Güzelce (Gözlüce) Kemer and Mağlova Kemer. Even in the driest months of the year the Kırkçeşme system, with a discharge of 4,200 m3 per day, was able to supply 158 different locations (94 public drinking fountains, 19 wells, 15 watering troughs, 13 public baths and 7 palaces among others.) The Halkalı water distribution system was also built by Sinan and provided water to Istanbul. It included the 50 km long Süleymaniye waterduct, which provided water to the Süleymaniye Complex and its neighborhood. In order to maintain pressure, water towers were built in a number of locations; one of these can be seen in Ayasofia Square. There is another stone water tower next to the Şehzade Mosque, which, judging by its Baroque profile must be l8th century. Works started in the reign of Sultan Mehmed II. the Conqueror were intensified when Süleyman the Magnificent was on the throne, continued throughout the reign of Mahmud I and, finally, of Abdülhamid II; this was a scheme that continued over a period of 500 years to satisfy Istanbul's demand for water with a system of reservoirs, aqueducts and supply lines, together with the fountains connected to them.